I love dip. I am made for dip. In my younger years, if I wasn’t ordering chicken fingers at a restaurant, it was some kind of dip. Instant high school/college dinner! Yes! While I don’t do that very often anymore, I do love me some dips for group appetizers. Snacky foods just bring people together because they’re always coming back for more! 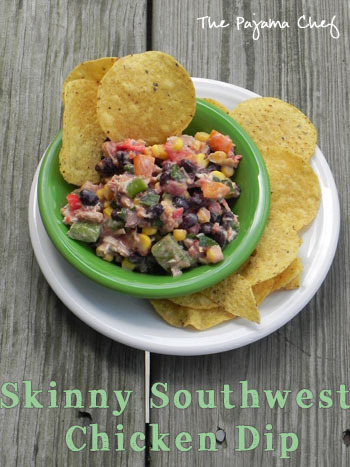 I made this Skinny Southwest Chicken Dip for the last big church event Ben and I went to in Bloomington, soon before moving to Nashville. This dip was a big hit with everyone, and I can see it being perfect for football parties this fall too! The seasoning for this creamy chicken, bean, and veggie dip was originally a flavorful blend of chili powder, onion powder, and garlic powder. But since I was making this for a crowd–and using the church’s dollar–I didn’t want to buy three new jars of spices. So I just bought one–an amped up Southwest Mrs. Dash. Seasoning blends can get a bad rap, but for dishes like this they are a fabulous bargain. [P.S. I also like to add those blends to roasted potatoes, hot rice, or even a wrap/grilled cheese.] Taco seasoning would be an equally great alternative, or you could go back to the original recipe and use the suggested blend, plus some cayenne for a ‘lil kick. 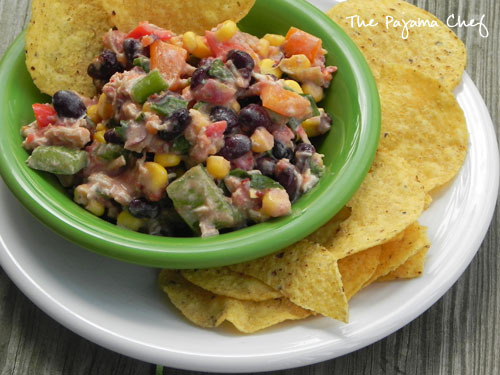 However you season this dip, the Southwest/Mexican seasonings pair amazingly well with the chicken, black beans, and veggies. Be sure to make this dip ahead of time so the flavors have time to marry in the fridge before being scooped up with a salty tortilla chip. I liked it best on day number 2! Enjoy! In a large bowl, mix together yogurt, Southwest Chipotle seasoning, chicken, corn, and peppers. Then slowly stir in black beans and tomatoes. Refrigerate for one hour or more [overnight is best] prior to serving with tortilla chips. This looks like perfect football food! Love that it takes best the next day, I need more dishes that I can make ahead of time! 1) YUM!!! Skinny or not, still looks delicious to me! 2) The chip hat in Despicable Me 2? Yeah, need it. I would be munching on chips and guac all day if I had one (and be proud of it!). Dip is da bomb, no joke. I love dip, too, and sometimes do eat it for dinner still! This looks like a great way to eat dip for dinner and not feel tooo bad about it! true true! it would also be awesome in a wrap i think 🙂 thanks sues! Dips are seriously one of my favorite things as well. And I love Greek yogurt too-I eat it almost every single day and love recipes that can sub yogurt to make it just a bit healthier without sacrificing flavor. That combination sounds delicious. Definitely need to make this one soon! thank you, marisa! this is definitely one of my new favorite dips so you should try it out! In my world, dip is an entire food group. Sign me up for this one. haha good strategy! thanks joanne! It’s always nice to have an appetizer that you don’t have to feel guilty about snacking on! Looks crazy yummy good! thank you colleen! 🙂 i agree!